Photo-reproduction from the collection of The Skyscraper Museum. In 1901, architects McKim, Mead & White were hired to enlarge the mid-19th century monument, the second Merchant's Exchange, as the new headquarters of the powerful National City Bank, which had been located across the street at 52 Wall since 1812. 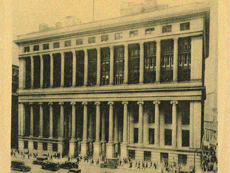 The classicists doubled the height of the Wall Street facade by adding a row of Corinthian columns above the orriginal Ionic colonnade. The interior was completely rebuilt, evoking the grand scale of Roman baths, or the same architects' Pennsylvania Station, with a cruciform banking hall, offices at corners, and upper floors for additional departments for international and domestic banking. The bank opened for business 1908, but was not completed until 1910. Depicted is a feature article in Fortune in March 1931, photographed by Margaret Bourke-White, the banking hall contains an elaborate tellers' cage as an island in the great room, and the operations of the institution are portrayed as the movement of vast amounts of paper. 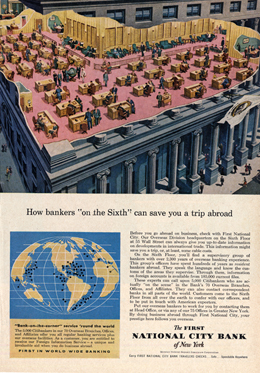 An advertisement of the 1950s (at left), touts the convenience of the transactions of the sixth floor Overseas Division, itself a sea of manned desks. National City Bank kept its headquarters on Wall Street until 1961 when it relocated to 399 Park Avenue and converted 55 Wall into a branch bank. After multiple mergers, National City Bank became known as Citibank in 1974. In 1965, the exterior of 55 Wall was designated a New York City landmarkand in 1999, the banking hall interior was also protected by landmark status. In 1998, the building was adapted for use as the Regent Hotel, which closed in 2003. The banking hall is now operated as an event space by the Cipriani company and the hotel is condos and serviced apartments.